News stories from the region this week highlight positive economic development activity impacting the commercial real estate market in Tucson. Summaries below cover hiring announcements, development and construction progress, and recent awards and rankings that demonstrate Southern Arizona's stature as a Sun Corridor growth market. PICOR’s Peter Douglas and Brandon Rodgers represented landlord Campus Research Corporation in an 81,835 sf lease to OptumRx, part of UnitedHealth Group. Tucson's workforce and climate were key factors in UnitedHealth Care's decision to locate the customer service center at Tucson's UA Tech Park. Links to the many news articles, press release and details on OptumRx's hiring plans, wages, and more are on TREO's website. 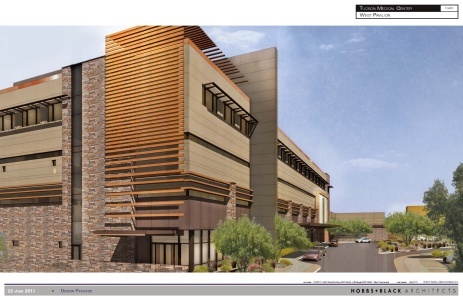 PICOR client and community hospital system Tucson Medical Center is well underway constructing its first multi-story facility on the Grant Road campus. At 200,000 square feet and four stories, the West Pavilion represents a $109 million investment by TMC and brings a world-class, high-tech surgery center to the market. Realtor.com places Tucson at the top of its list of cities for residential investment property, ahead of Austin at #2 and Kansas City at #3. Read more. Davis Monthan AFB in Tucson was recognized as the best Air Force installation in the Department of Defense, receiving the Commander-in-Chief Installation of Excellence Award, signifying the sterling level of base and mission operations achieved under the command of Col. John Cherrey. DMAFB's $1.6 billion local economic impact and employment of nearly 15,000 direct and indirect jobs with a payroll of more than $212 million make Davis-Monthan one of the biggest contributors to our local economy. Phoenix-based U-Haul International released its annual list of Top 50 moving destinations. Tucson ranks 31st, and joins other ranking sunbelt cities such as Phoenix, Albuquerque and Las Vegas.